No chance of a White Christmas here, but hey - you can enjoy Christmas in relative warmth. Valencia gets very pretty over Christmas: lots of gorgeous iluminations and lots of energy in the streets. The main area to see the Christmas setting is of course the centre of Valencia, especially all the landmarks such as Plaza de la Reina and Plaza de Ayuntamento. Plaza de la Reina will host the Christmas crafts market - good for souvenirs and local delicacies. Plaza de Ayuntamento will host the main Nativity Scene - those compositions will be throughout the city over Christmas. 24th Dec - Fun Christmas Eve is not a peaceful in Spain as in other countries. After a meal with the family the crowds will hit the hightlife hard, making it almost as much of a party as the New Year's Eve. Note that bars won't open until 1am. 25th Dec - Zzzz Christmas Day is, of course, a national holiday and everything is closed - it is a day for relaxation with the family. Kids dont get main presents today, only the Estrenas - small gifts or banknotes from relatives. To do: A prank on a local will probably break some ice. Be careful yourself, although most Valencians would think it is below the belt to prank a tourist. Read newspapers if your Spanish is good, look out for the journalist named Innocentio Santos. New Year is, as usual, party time and Valencia will go crazy. Many venues will host New Year events and the crowds will gather on the Plaza de Auyntamento for the year's biggest fireworks (and in Valencia this means VERY BIG fireworks) at midnight. They may also instead do a spectacular public function with light show and fireworks at the City of Arts and Sciences - check with the tourist office. One particular tradition is to eat 12 grapes (Las Uvas) for each chime of the clock, to bring good luck for new year. You can buy these just about anywhere. To do: Go out, mix with the crowds, watch the fireworks at midnight, have Las Uvas for good luck in the new year, party till dawn. 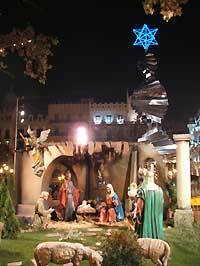 The Day of Three Kings is the biggest Christmas Spectacle in Valencia. At 5 pm the Kings enter in a grandeur procession and proceed to the Plaza de Auntamento for the main ceremony. Then the City Hall opens for the Valencians to come in and receive presents from the Kings. The next morning kids finally find the presents they asked for when the Vizirs of the Kings came round in mid-December. To do: Dont miss the show. Valencia also stages traditional Christmas events for kids and adults. They range from Christmas markets and high-profile circuses to the 2-day festival in the City of Arts and Sciences. There really is plenty to do in Valencia during that period. In due time we will update you on what is coming for the 2007 Christmas.